I don’t know if you’ve seen SAS‘s campus. It’s a collection of enormous glass buildings. Abstract art greets you throughout the grounds. Outside the S-building stands a thirty-foot structure of red pipes bent at 90 and 45 degree angles and inside is what looks a bit like the cross-section of a cube. Looking out a window, one can just see the top of another big glass building over a copse of conifers. As of the Friday before last, this is the organization that offers the funds that provide my stipend and pay for my tuition. Leaving the Leonardo project happened so subtly that my team and I all forgot to have some sort of commemoration ceremony. Last Friday I stood up from my desk shook my team leader’s hand, telling him it was “good working with him,” then he said we should arrange for one last team celebration. Our co-workers joked that this might be like the going-away parties in the Godfather, and I recommended we make sure to eat at a popular, well-lit restaurant. Now my way is paid to work on deep learning for language. Really, I couldn’t imagine a better fit to my interests. Of course I’m interested in Natural Language Processing, and my zeal for deep learning is such that I need to actively temper it to avoid poisoning conversations by implying to other researchers that all the techniques they’ve been using are outdated and soon to be obsolete. Now I get to work with a group of people to put my money where my mouth is and actually make something revolutionary, or at least useful. Since we’re just starting, right now I’m reading papers about deep learning language techniques. I’ve found twenty-five papers over the last three years in the small set of conferences that I’ve checked. There’s an awful lot of interest in the domain of machine translation, but my favorite paper thus far has taken a sentiment analysis approach to identifying ideological biases in written text. With deep learning, it is able to understand that “the big lie of ‘the death tax'” is ideologically liberal, whereas an old-style system would take words two or so at a time and likely see “death tax” and think conservative. Last week I was in Indianapolis at a conference: Learning Analytics and Knowledge. This was the first conference at which I gave a presentation, and it went pretty well. It was difficult to tell how I was doing as I was giving the presentation – there’s not much audience reaction to a research presentation for the most part, it turns out. However, I put my twitter handle at the top of the first slide of my presentation, and I got some nice comments. I also had a number of people talk to me afterwards about various issues surrounding the topic of elementary school short answer assessment, which was a good sign. Besides presenting, I had a number of interesting experiences in Indianapolis. While I was at the conference, a keynote speaker showed off the “Fish-ix” tutor, finally linking the two very different disciplines of science education and talking fish. Outside the conference, I got to enjoy the attractions of Indianapolis. I got locked out of the Soldiers’ and Sailors’ Monument and was warned not to enter the Indiana State Museum with the explanation that in the 45 minutes before closing I would not be able to get my money’s worth. When I asked the cashier, she said “sure, we have Lennonade,” and showed me this bottle. “Oh, we don’t have that, the cashier said,” but we do have a long line of other dictatorades. She pointed me to the cooler where they kept a variety of interesting sodas. This was no substitute for Leninade, so I decided not to get a soda at all. I kept looking around at the different kinds, though, and my eyes landed on the unusual flavors section. This was where my troubles began. You see that “Sweet Corn” soda there? The cashier insisted that everyone who tried it loved it so much they came back again and again for it. I enjoyed the story, but was not yet moved to try the soda myself. As we were returning to the register, I asked the cashier to recommend Leninade to whoever stocked the shelves. She told me, “you can ask him yourself if you want,” and gestured behind me to a man in a gray-and-black beard. “Hi, I’m the manager,” he said. 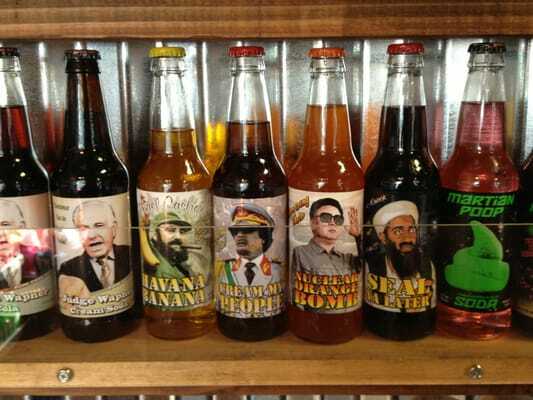 I asked him about Leninade and he brought me to his “long line of dictatorades.” At this point I figured he wasn’t going to get the message, so I asked him about the strange flavors. Without missing a beat, the manager began singing the praises of the sweet corn soda. “This soda is extremely popular because it tastes exactly like sweet corn.” That swayed me. I purchased the soda, popped off the cap on a wall-mounted bottle-opener, and took a swig. Fortunately, I managed not to spit it up immediately. To this day I cannot describe what it was I was drinking or the exact nature of my revulsion towards it, but I do know that the look on my face was enough to horrify the manager. The manager apologized profusely and insisted that I take another soda of my choice free of charge. At first I refused his offer, but he wouldn’t take no for an answer, so rather than try another strange flavor I got a sarsparilla, which was nice. It tasted like an alternative cola recipe. As I write this post to you, dear readers, I am standing and walking forward at 0.6 miles per hour. Well, I would be if I were writing from Raleigh rather than Chapel Hill visiting my family where I have no such treadmill desk. For the moment, let’s imagine that I am doing now what I have been doing for the past week and there are no unusual circumstances screwing things up. I have wanted a treadmill desk ever since I learned of their existence years and years ago. The problem? They’re expensive. They generally run around $1000 on average. At a minimum (from a cursory glance at Amazon) they’re about $800. Even for a purchase for my health that felt steep. Then my roommate Joe announced that he had acquired a treadmill desk for $200. How did he do it? He took advantage of the fact that, in the end, a treadmill desk is just a treadmill under a standing desk. The cheapest treadmill on Amazon goes for $200 and with a little work can have its arms removed so that it slides neatly under most tables. Then stack up some (relatively stable) boxes and crates to make a standing desk and voila! For more details you can consult this guide. Let me tell you about owning and regularly using a treadmill desk: It’s tiring. The first few days I would walk for a few hours working and feel like my feet were going to fall apart. I got used to it eventually, but I still take my computer down to the side of my table for a simple sitting desk now and then. One issue with this treadmill desk that has actually turned out to be an advantage of sorts is that the treadmill itself is so cheap that it only has one timer setting – thirty minutes – that cannot be turned off. I will be working for a while getting into what I’m doing when suddenly GLOMP I stumble forward on my abruptly motionless treadmill. Sounds pretty annoying, right? Stay tuned for another entry today on my recent foray into ChefScript.